There has been an urgent call recently to connect people back to natural places, especially in urban settings. Research shows people are more likely to advocate and care for their environment when they have a strong attachment to a place. 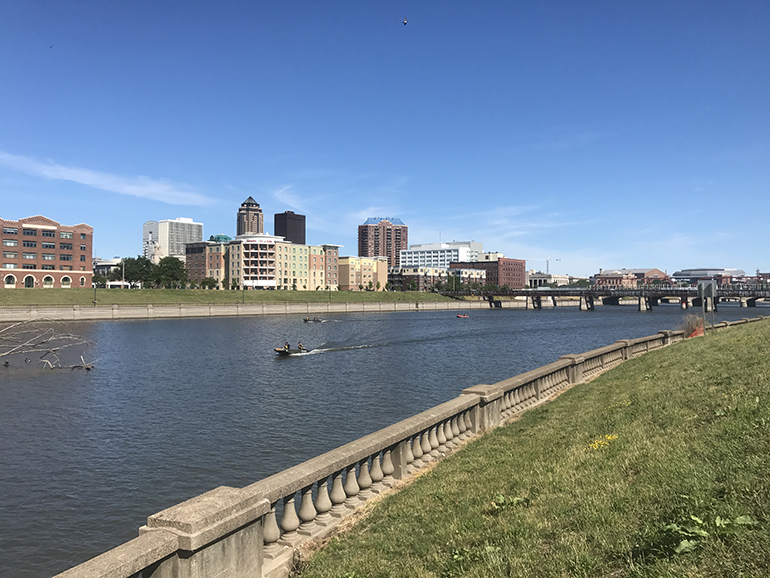 In Des Moines, one of the greatest resources we have—the reason the city is located here in the first place—is the confluence of the Des Moines and Raccoon Rivers, which flow through the metro and connect south of Principal Park. Through history, we have had a love/hate relationship with the rivers we settle around. They provide transportation and drinking water, yet, as a society, we ignore them—until they flood, and remind us we live in their space as well. We build levees to tame them, but they keep fighting back. As you view the river in Downtown Des Moines, there is a disconnect. During the City Beautiful movement, our downtown river was cordoned off with balustrades. The city was above the river, separated from its natural state, to be appreciated at a distance. Along the Raccoon, levees separate us from connecting with the river. 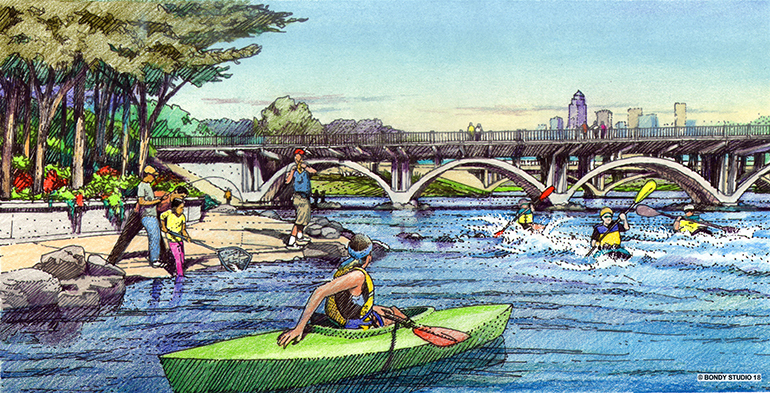 One of the main objectives of the Downtown Water Trails project is to connect people back to the river. 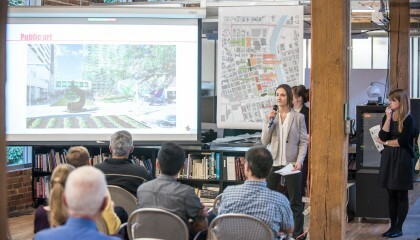 As landscape architects, our charge was to find meaningful ways to make those connections. 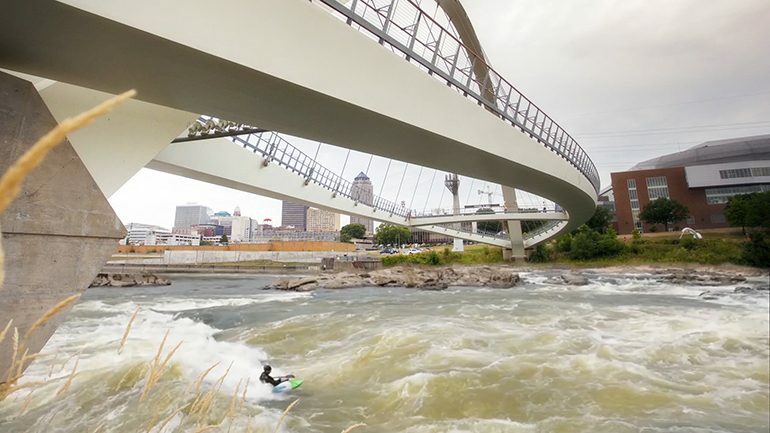 The Des Moines Water Trails project started with the Tomorrow Plan in 2013. 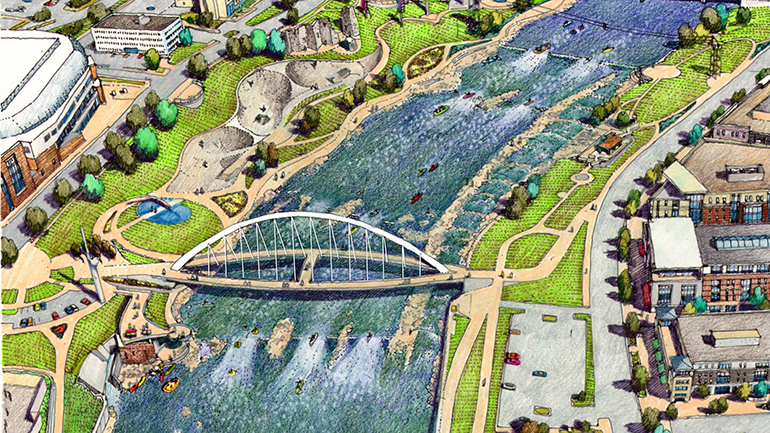 This plan, created by the Des Moines Area Metropolitan Planning Organization (MPO), calls for a regional water trails system to activate the 200+ miles of connected recreational potential within the metro. This spurred the first round of Dam Debates, which gathered input from the community about what should happen with the downtown dams (completed by Bolton & Menk). 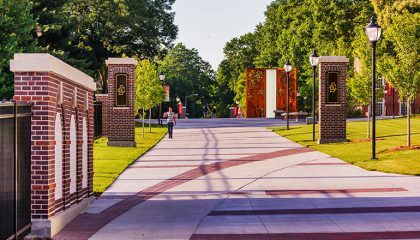 RDG partnered with McLaughlin Whitewater out of Denver, and HDR in Des Moines, to complete an engineering feasibility study and set up a framework to take the project forward into implementation. Learn more here. A long list of criteria and constraints stood in front of the team. Most issues would be solved by the engineering team—making the dams safe and maintaining pool elevations for infrastructure upstream, without negatively impacting flooding elevations. RDG encountered different constraints on the upland amenity side. The balustrade walls are important to the historic character of Des Moines, and were to be maintained, greatly reducing access to the river. All three dam locations have a levee on one side, if not both, to prevent floodwaters from inundating the city. And there’s not much land available to work with, given the goals of river access, parkland and programming. Existing recreational users of the river were also to be considered. Through public input, the hydraulic results from the engineers, and the existing adjacencies, the team identified unique characteristics and appeal for each dam site. The Fleur Drive Dam, located on the Raccoon River, would be flooded. 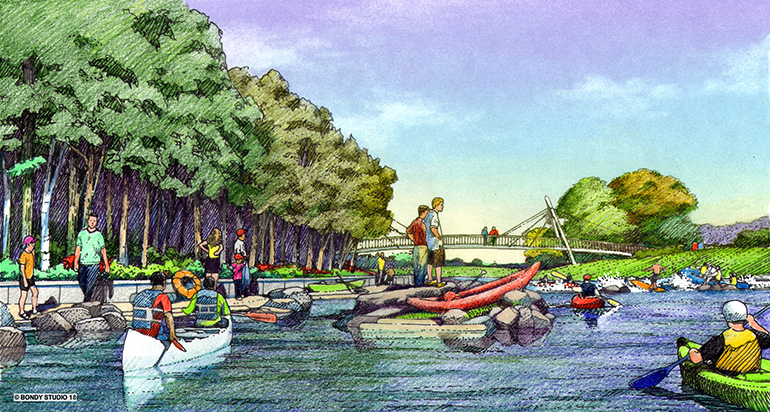 The in-river recreation would be moved downstream, to an area with more suitable adjacent land uses. Named the “Learn and Play” site, a person could take a boat out on the river and try their hand at recreating. The adjacent land provides opportunities for fishing, as well as a calmer fish passage, where a canoe could pass through the site. The second site is the Scott Street Dam, named “The Nature Connection.” Due to its proximity to a large wooded floodplain, many fauna live nearby which are sensitive to disturbance. This factor, coupled with the low availability of land and being a favorite spot for fishermen, prompted a lighter touch on the site. In-river, the engineering team was able to make fish passage possible, integrated into any recreational opportunities. 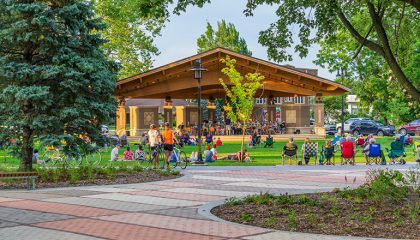 The last dam, located at Center Street, is named “A High-Energy Adventure.” Nestled in the heart of downtown, this site is nestled amid park land. With opportunities to jump into the excitement of the Lauridsen Skatepark, soon to begin construction, and the liveliness of downtown, this site also boasts the highest level of excitement in-river. Thanks to the height of the Center Street Dam, this site has the potential to draw paddlers from across the country. Potential for rock climbing and zip-lines can attract adventure seekers. However, we know that for every person recreating in the water, there are nine people watching from shore. The space would feature a scattering of places for people to stop and watch. 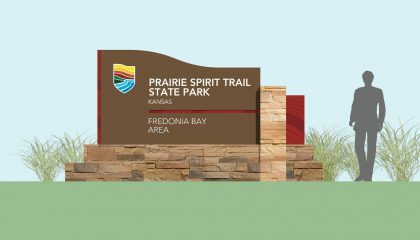 Through the process, many improvements to existing infrastructure has been proposed, a wide swath of opportunities to bring people back in touch with our natural areas. There is a place for the urban fisher. There is a place for the biking commuter. There is a place for the high-adrenaline enthusiast. There is a place for boaters of all levels. There is a place for surfers. There is a place for the passive onlooker. There is a place to touch the water. And, somewhere along the downtown riverfront, there is a place for everyone.